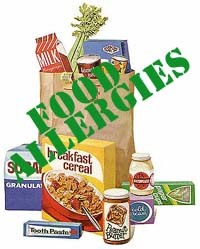 Elimination or allergy diets are used to isolate food allergies or food sensitivity. A food allergy describes an immune system response, whilst a food intolerance is an adverse reaction to food (unrelated to the immune system). There are a number of medical symptoms that may be related to food; candida, irritable bowel syndrome, diverticulitis, asthma, eczema, migraines, unexplained rashes, and lactose intolerance. The basic elimination diet first removes all potential food allergens from the diet, and then re-introduces these foods one at a time. These process should always be undertaken in consultation with your physician. When undertaken an elimination diet, it is advisable to keep a food journal, and log all food items and amounts as accurately as possible – along with any symptoms experienced. This can help to isolate food allergies or intolerances. Food products containing gluten, such as wheat and wheat-based products (including pasta), and barley, oat or rye grains. (Alternative grains could be brown rice, buckwheat, spelt, millet, potatoes or sweet potatoes). Note that suddenly stopping some foods (such as caffeine) can result in withdrawal symptoms (typically headaches) – however this should only last a few days to a week. The reintroduction period allows sufficient time to determine any intolerances. This drastic elimination diet involves fasting for the first 5 days, taking nothing but bottled spring water. This kind of elimination diet should be reserved for only the most difficult cases. Do not try this fasting approach without first consulting your doctor. As the name suggests, this diet involves only eating lamb and pears. The diet is sometimes modified to a turkey and pears, or turkey, rice and pears). This diet is also for only the more severe cases. This is an extension of the few-foods idea, except that instead of eating uncommonly- eaten foods the patient is asked to eat exotic items (e.g. yams, buckwheat). This is the typical form of elimination diet where most fruits, vegetables, fish and meats are allowed, but wheat and other cereals, milk, eggs, and other common offending foods are eliminated. This type of elimination diet is often the most helpful. I have excess saliva (foaming type) every day. I use alot of aspertane in tea. Every time I drink tea, I seem to just get too much saliva and have to spit in kleenex. what is your thought on this.? Spelt is considered wheat, it contains gluten. It is NOT an alternative to wheat. Although this article is very helpful there is one error. You are not supposed to have any soy products during an elimination diet. Why? Because many people are allergic to soy. Also you are not supposed to eat white potatoes, but you can have sweet potatoes.